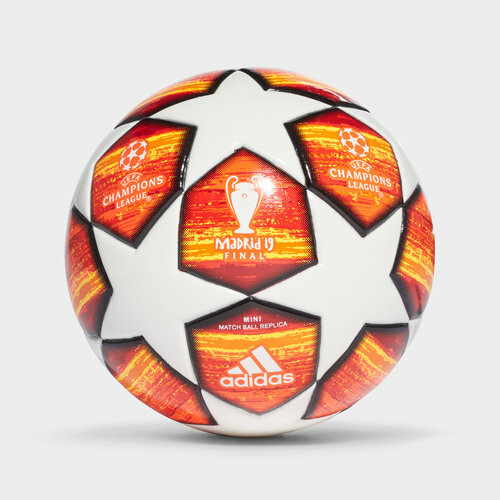 If you're a big fan of the UEFA Champions League then commemorate the competition with this adidas Finale 19 UEFA Champions League 2019 Madrid Mini Football. This football from adidas is the official match ball used in this season's knockout stages and final. Stars collide on the pitch and on this ball as the UEFA Champions League heats up leading to the final in Madrid. The ball boasts the latest adidas performance technology to ensure the world's best players can perform at their optimum level during the UEFA Champions League. This ball uses red and orange tones linking to the country in which the final will be held, Spain. The Madrid Finale19 continues the trend that the group stage ball started by inverting the colour scheme used in previous years and having white stars and a red graphic print that features Atletico Madrid’s home, the Wanda Metropolitano, the stadium that will host the final. It has a seamless surface for high-quality performance and a textured outer coating that enhances its flight and touch. The vibrant design is inspired by the final´s venue in Madrid. A FIFA stamp confirms its quality. TSBE technology for a seamless surface with better touch and lower water uptake. Containing high durability and outstanding ball control.